Right-wing evangelical organizations have raised tens of millions of dollars, over the past 10 years, to fund settlement projects in the West Bank, a report published by Haaretz newspaper reported, on Sunday. According to the PNN, the newspaper said that it had conducted an audit of the funds, estimated to be between $50 million and $65 million — based on media reports, US tax records and the Molad Center brief composed in 2015 — that 11 evangelical organizations contributed to the figure. One such evangelical organization is the Jubilee, in which evangelical volunteers are sent to Har Bracha, a settlement in the West Bank, near Nablus. Jubilee is one of many evangelical organizations active in what it calls the “biblical heart of the country”. Over the past 10 years, the Jubilee has sent about 1,700 volunteers to the settlement. Jubilee has worked for several years without announcing its activity, claiming that it would be better for the Israelis not to know about it, but is now hosting journalists and others, in a “campus” that it has established in Har Bracha. The paper pointed out that the readiness of this organization, to reveal its activity in the West Bank, shows the significance of relations between the evangelicals and settlers. The Israeli Ministry of Strategic Affairs, which is headed by Internal Security Minister Gilad Erdan, announced several months ago that the Jubilee organization will receive $16,000 a year, a sum that is expected to increase, from the Israeli government. The ministry said it was giving the money to the evangelical organization in light of its pro-Israeli and pro-settlement media activity among evangelical communities in the United States. Aharon Katzsov, founder of the Israel Heart Association, also known as the Benjamin Fund, said that his association collects hundreds of thousands of dollars annually, for projects in the settlements. But he pointed out that most of the funds raised by this assembly come not only from evangelicals. “When a Jew donates $ 1,500, the Christian pays $ 50 on average, but their numbers are growing very rapidly,” he told the paper. The newspaper said that the settlement “Ariel” gets its largest donations from evangelicals. In 2008, it received $8 million, for a sports zone. Evangelicals also donated $1 million to the Jewish-Christian Center in Efrat. The paper added that it is difficult to know how much financial support for settlements comes from evangelicals, because non-profit institutions and churches registered in the United States are not required to provide authorities with detailed reports on sources of funding or disclosure of donations, and assistance to settlements is recorded not only by money but by volunteer hours. Thousands of evangelical volunteers work in settlements. For example, 175 volunteers participated in picking 340 tons of grapes in settlements, this year, working a total of nearly 5,000 hours. A report issued by the Molad Center, three years ago, said that it is impossible to estimate the amount of financial support that evangelical organizations transfer to Israeli settlements, because many Israeli non-governmental organizations that are active in the West Bank are in direct violation of international law. The report added that “a large portion” of all evangelical investments, in Israel, reach the settlements benefiting from regional councils, right-wing societies, random settlement outposts, commercial interests and travel agencies specializing in tours of settlements. The political expediency shown by evangelical alliance with Israel has only grown in recent decades. So, why is there such strong support from evangelicals? According to an earlier report by CNN, in the last 12 months, the evangelical Christian community in the United States has actually given $100 million to charitable causes in Israel, according to Rabbi Yechiel Eckstein, founder of the International Fellowship of Christians and Jews. “God promises Abraham those who bless Israel and the Jewish people will be blessed and those who curse them will be cursed,” he says, incorrectly interpreting and paraphrasing Genesis. Not only this, but evangelicals see the creation of Israel in 1948 as the fulfillment of biblical prophesy, Eckstein says, “it reflects the hand of God”. 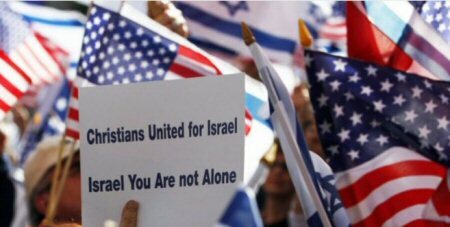 Not only is the support from evangelicals, for Israel, believed to be the fulfillment of a biblical prophecy that they vehemently believe in, but they have also had great influence with Trump’s administrative decisions relating to Israel, as the far-right Christian groups puts pressure on a president eager to show he’s fulfilling his campaign promises.